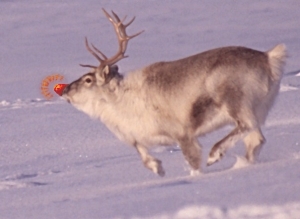 Rudolph the Red-Nosed Reindeer is a reindeer with a bright red nose who first appeared in 1939 in booklets. In the story, Rudolph gets teased by other reindeer until one foggy Christmas Eve Santa Claus comes around, asking him to guide Santa's sleigh. A Christmas song based on the story has been covered by such artists as Bing Crosby, Dean Martin, Barry Manilow and The Supremes over the decades. Young Rudolph (right) and Hermey the Elf as seen in the 1964 TV special. Rudolph the Red-Nosed Reindeer Facts for Kids. Kiddle Encyclopedia.